Known as "Old Pete" during his career, Grover Cleveland Alexander stands with Walter "Big Train" Johnson and Christy "Matty" Mathewson as the 20th century's tallest pitching titans. Collectively, they won almost 1200 games and struck out more than 8000 batters. This mighty trio appears as #4, 5, and 6 in Shakey's set of 25 all-time greats. Old Pete pitched during the dead ball era, when games used (and re-used?) a single leather sphere until it was stained with dirt and scuffed to hell. Their relatively solid interior got less and less springy at each contact; today's horsehide bounces off the bat by comparison. The card bio calls Philly's home stadium, the Baker Bowl, "notorious" because of its hitter-friendly short right field and high wall. Winning an ERA title there would be like turning the same trick in Fenway Park today. 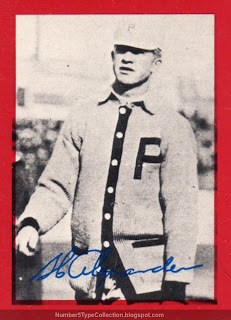 Known primarily as a Phillie, Alexander actually won less than 200 games in Philadelphia. He pitched another 8+ seasons in Chicago, and 3+ in St. Louis, rounding out his win total. The 1926 Cardinals finally provided his lone World Series title at age 39. 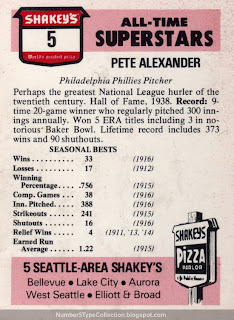 Fakes / Reprints: As a small-scale pizza chain, Shakey's didn't produce a lot of these cards, but I don't expect to see reprints in the market--it's just not interesting or valuable enough.